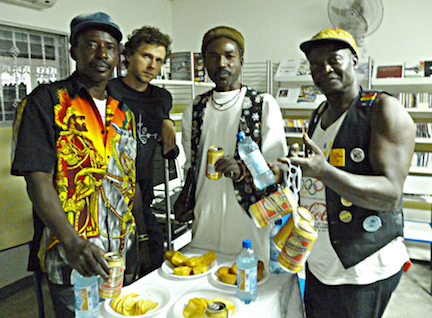 We had arrived in Port-au-Prince on December 30, 2011, and planned to leave on February 28. Makandal drummer Morgan Zwerlein joined us mid-January. During those two months I looked for ways to re-connect Frisner with his hometown and country. 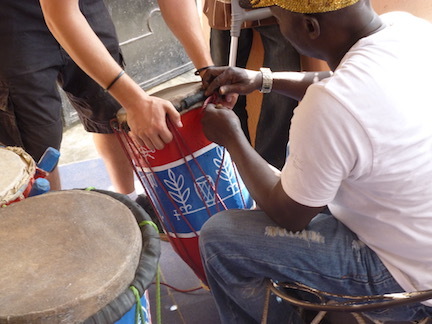 By February we were making plans for 2013 with the Festival International de Jazz de Port-au-Prince and the École Nationale des Arts (ENARTS, National School of the Arts). We created a local children’s carnival that entertained the neighborhood the week of February 20. We had also acquired a fine set of drums—three Rada, two Petwo—and decorated them with vèvè for various spirits (see photo upper right). Throughout the trip we were posting a video series called Mesaj Ti Kelep (Ti Kelep’s Message). Each installment followed our activities in Haiti and conveyed a message for Frisner’s students and followers back in New York. I uploaded the fifth Mesaj on February 19. Mesaj Ti Kelep 5 captured highlights from the concert at the Institut cited above. The Institut collaborated with ENARTS to produce a series of Thursday evening concerts featuring a wide variety of music styles. We had Stéphanie St. Louis of ENARTS and Nathalie Forsans of IFH to thank for scheduling Frisner. The ensemble included Morgan Zwerlein on second drum and Walther Mondésir on third, and our dear friend Alphonse Clénord—aka Djabolo—supported on vocals. They used all three Rada drums plus the largest Petwo from the newly finished set. We went to the Institut early in the day for a soundcheck and returned in the evening for the show. Television National d’Haïti (TNH) recorded the performance for broadcast on February 26, and I recorded it for the fifth Mesaj. Makandal offers you this Tale from the Archive on the fifth anniversary of the maestro’s passing. To honor him further, you may join the konbit (work brigade) with a contribution to the Frisner Augustin Memorial Fund. Read about it and donate here. Many thanks! 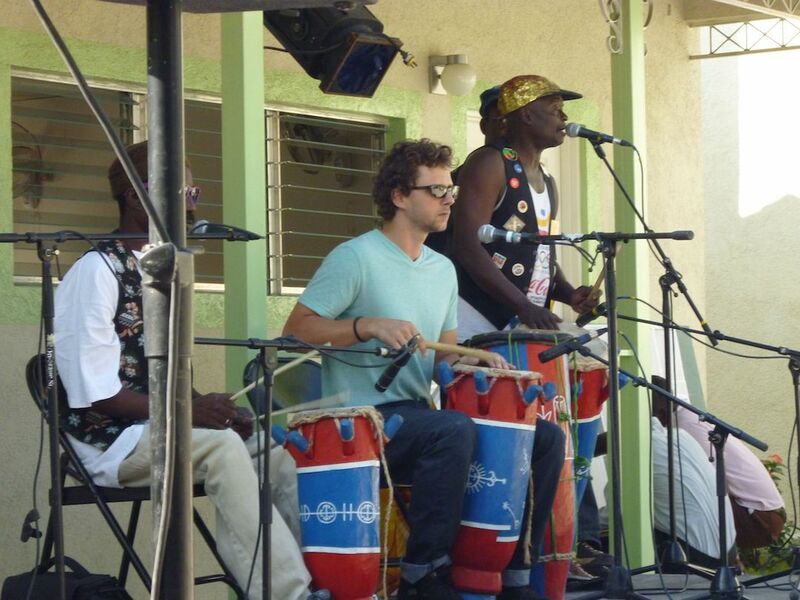 This entry was posted in Tales from the Archive and tagged Archive, Drumming, Drums, Frisner Augustin, Haiti, Haitian, Haitian Music, Institut Français Haïti, Music, Port-au-Prince, Vodou. Bookmark the permalink.